We are specialists in aging and palliative medicine. Our expertise is in optimizing the health of older individuals and those with serious illness. We work in the community and on virtually every UCSF campus – Parnassus, San Francisco Veterans Affairs Medical Center, Zuckerberg San Francisco General Hospital, Laurel Heights, Mission Bay, and UCSF Center for Geriatric Care. We are specialty-trained doctors who provide the care patients want, when they want it, and where they want it. We care for patients in their homes and in hospitals, clinics, and long-term care settings. 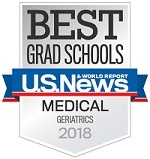 As teachers, we focus on producing the best clinicians, scientists, teachers and the next generation of leaders in geriatric medicine and palliative medicine. As scientists, we seek to understand the causes and outcomes of illness as we age, and to improve the health and well-being of older persons and those with serious illness. The vision of the UCSF Division of Geriatrics is to transform health care to optimize aging and improve well-being—no matter an individual's health or situation. Our goal is for everyone to receive person-centered medical care — care that helps them safely navigate the health care system, maintain dignity and independence, and experience improved quality of life and well-being.